Not sure what is best, click HERE to compare the options. It is important to print the pages yourself if any of the following apply. 1. If colours/shading, etc of the printing is critical. 2. If you want special paper - for example a tinted paper rather than a plain white paper. 3. If your volume is a non-standard size or shape (i.e. If you are printing on anything other than standard A4 portrait paper). We have, at this stage, only made arrangements for standard printing. Though the copycentre can cope with A3s and folding, too. If you are making an 'odd sized' book, it is important that you read our section on paper grain - see Preparing a thesis for binding. Also note that we can trim pages down to size if you are printing on a larger size than you actually want to bind, as we have huge guillotines. 4. If for any reason you have concerns about the printing result. 5. If there is a VERY limited binding timeframe. Print Options - For A4 portrait thesis. It is important to choose the page formatting option that matches the formatting of your thesis! A3 pages and folding. If you have any A3 pages, please list them here. Of necessity, these forms only cover some the universities and colleges that we regularly bind thesis for. If you are studying with any other university or college, please just select "other universities and colleges". We do NOT require that personal copies fit in with any university requirements - if you want something different for your own copies please add this in the notes section. Auckland University requires a lumbecked binding, library buckram for the covers and for lettering the author's title (or abbreviated title) AND the author's name (often initials and surname) on the spine. A front title is not essential, but it is very much more usual to include this. Don't forget to include your Thesis Consent Form which is bound in as the first page of your university copies. Click HERE to see our standard buckram colours, for the hard covers. If you are ordering multiple copies, they can be bound in different colours. To arrange this, please add a clear message in the notes section below. Also, be careful to note which colours contain the library consent forms. NB 85 characters including spaces, of upper and lower case type is about the maximum that will fit in a single line down the spine. Capitals will fit even less. So, ideally the combined total characters in both (short) title and your name are less than this. If you need more wording than this multiple line titles may be possible (extra cost) - depending on the thickness of your books. AUT - Auckland University of Technology requires that theses/dissertations/exegesis are full bound in cloth or buckram. The front cover must contain the candidate's full title, full name, abbreviated degree and the year of lodgement for examination. The spine must contain the candidates initials and surname, the abbreviated degree and the year of lodgement for examination. Don't forget to include your PGR15 form which is bound in as the first page of your library copy. Click HERE to see our standard buckram colours, and HERE for the buksyn colours - for the hard covers. If you are ordering multiple copies, they can be bound in different colours. To arrange this, please add a clear message in the notes section below. Also be careful to note which colour contains the PGR15 form. Traditional requirements for Massey University are that the thesis must be hard-covered and cased in cloth, buckram or rexine. The sheets must not be stapled. The cover should contain the full title, the author's name and initials and the year of completion. The spine should contain the author's name and initials and the year of completion. Click HERE to see our standard buckram colours, and HERE for the buksyn colours - for the hard covers. Note that we do also have rexine available; it is a cloth more commonly used on Bibles, than on thesis - however it is available if you want it. If you are ordering multiple copies, they can be bound in different colours. To arrange this, please add a clear message in the notes section below. Otago university requires a permanent binding for the final submission of thesis. Otago university allow you to choose the colour of the cover. Gold lettering is required down the spine of the thesis. This spine lettering must contain a short title and the author's surname. Front lettering is optional. Every copy of a thesis which is deposited in the University Library system must include a declaration signed by the candidate concerning access to the thesis. If you are ordering multiple copies, they can be bound in different colours. To arrange this, please add a clear message in the notes section below. Also be careful to note which colour the copy containing the declaration form is. If you would like it - does definitely make the volumes look good! Unitec requires that thesis copies submitted to the postgraduate office are bound in full library buckram. In addition the requirements state where on the cover the lettering is to be placed. 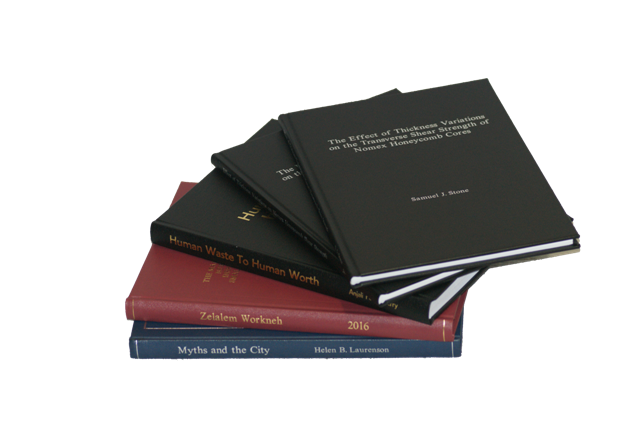 Victoria University of Wellington requires that thesis volumes must be fully bound in cloth or buckram, but the colour is optional. The author's full title and full name are required on the front. The title (or short) title and the author's initials and surname are required on the spine. Waikato University guidelines state that a thesis should be bound in black buckram. Note that we have checked the three black materials listed (one of which is black buckram) with the university and they are happy with all three, so it comes down to departmental preference and personal choice. Contact us if you are worried, about which you should use. Personal copies can, of course, be bound in different colours if you prefer. Waikato University thesis are lettered in gold. Normally they have the full title and full name on the front (with the year not required, but quite common). The spine lettering required is the title or short-title of the thesis with the initials and surname of the author. The Waikato University guidelines point out that when arranging for the binding, you should be prepared to provide a shortened title. Click HERE to see the 3 standard black materials. If you are ordering multiple copies, they can be bound in different colours. Click here to see standard buckram colours and here for the buksyn colours. To arrange this, please add a clear message in the notes section below. We regularly bind theses, dissertations, research projects and similar works for students based at many other colleges throughout New Zealand and also often for students who have studied at overseas universities/colleges. This includes research institutes, Wānanga, business, theological, art, and vocational colleges. 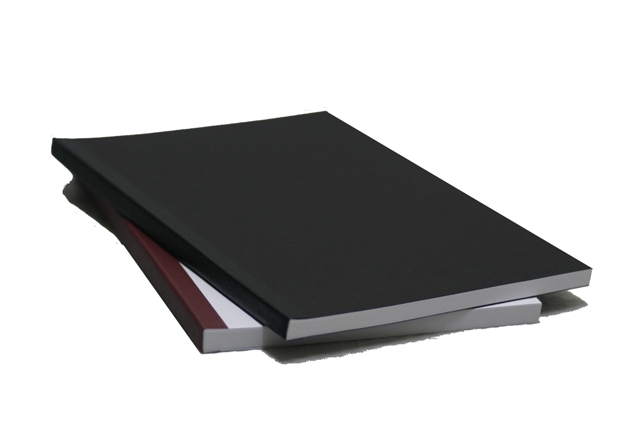 Click HERE to see our standard buckram colours, for the hard covers. Click HERE to see the buksyn colours and HERE to see a comparison of available black materials. NB Lumbecked soft binding is the recommended option at Auckland University, though other options are often used especially where there isn't much time. Type of soft binding (often called limp binding). If you would like your soft bound volumes titled, we recommend full title, full name on FRONT ONLY. (Please add information to the notes section if something else is required). Clear plastic front cover and black material spine and card back cover Black buckram spine strip and black card sides. Note if lettering is required use this option. It is VERY important to note that this is not an exact figure! This estimated cost is solely based on the number of copies being bound and a standard figure for typesetting. THE BOOKBINDERY WILL CONTACT YOU WITH AN EXACT TOTAL ONCE WE HAVE RECEIVED YOUR INSTRUCTIONS.